Designer and artist Hongtao Zhou guides his Hawaiian student Erika Drake to tight up and fix a broken stool with melting plastic bags. The melting bag tissues wrap the broken joinery like spider web and hold the legs and seat together to be sitable. 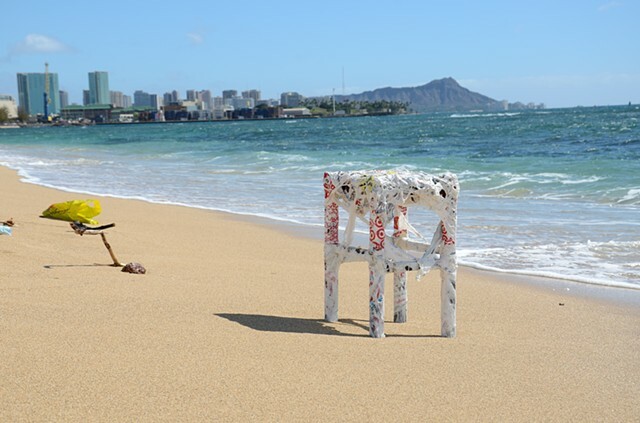 This repaired piece demonstrates the plastic impacts to the islands of Hawaii in the middle of pacific, which actually showcase a larger global plastic issue. There are still a lot facts about their impact to marine life remain unknown in deeper ocean. Not only the sea debris plastic arrives on Hawaii coast line from the patches from oversea, but also locally, in Hawaii, plastic bags are everywhere from stores to stores. Hawaii is a state with limited recycling programs but constantly receives commercial materials from all over the world. Very larger portion of daily materials in Hawaii are imported oversea and eventually be land filled locally (where land is very limited) after their life-cycle. This piece is a sample of demonstrate how plastic bags trap our life and how dangerous they are to the Eco system. However, if reused properly, it could be useful in some way. It is a call to reduce the consumption of plastic product in our daily shopping, especially for islands like Hawaii. This project is completed in Ericas first year studio working with assistant professor Hongtao Zhou and Maria Simon in the School of Architecture at University of Hawaii-Manoa campus.